The software program from EVOMSit for this car has made it even better. Like NIGHT & DAY!!! We arrived around about 10.30am (your time 10.30pm) with both ECU’s. Fitted the ECU’s, started it up took the car out for a test drive with the owner. When I slowly and briskly accelerated away you can feel the smoothness and low end torque to be better. Continued driving slowly with the traffic and the car was behaving better than before. Once we reached the highway ALL HELL WAS LET LOOSE! I floored the car with “RACE” mode activated and the pull was absolutely fantastic. All the way till redline. The torque and power delivery is stronger and throttle response much sharper than before. Oh yes, gear changes seems to be smoother than before. I drove right up to 170mph/272 kph with no issue and the car still had more to give. The owner took over and tested it himself. This time he pushed the car to 188mph on the way back as less traffic then. He was SO IMPRESSED! He never knew that with Fabspeed headers, sportcats and EVOMSit software could the car be made to drive this responsive, smooth as silk and power. This is 1 Scud/16M that’ll eat 997 TTs and GT2s for breakfast. As far as I’m concerned all F430s should do this complete upgrade be it may a normal F430 or Scuderia/16M. Well worth it all day long. No regrets! Many thanks Fabspeed Motorsport and EVOMSit. These are one of those moments that make me feel proud being your Malaysian distributor here. Thanks fellas. Sorry for the delay in getting you the final dyno plot. As I mentioned previously the ECU was easily reinstalled and the driving result was very noticeable. The throttle response is very crisp and the car is much more drivable. Thanks for the great service. I’ll let you know how it runs over time especially when it gets hot this summer and I’m running the A/C load too. I got 50 hp! I got 20 to 30 over a stock scuderia out of my F430. This car is amazing now (not that it wasn’t before) . It used to whine like a banchee now she growls like a vicious wounded lion and over 3500 rpm and its unbelievable. It took them 24 hours to do the work. They are geniuses. I wouldn’t have anyone else do the tune. Seat of the pants impressions so far are that the car is incredibly faster in 2 places…off the line and above 5000 on the tach. It pulls strongly all the way to red line. I need a closed road or a track to really explore the vast possibilities that the car possesses. Here is what I had done…headers, EVOMSit ECU, carbon airboxes with new filters, and the pipes from the muffler with valves and integrated stainless steel tips. I think that was everything. Todd, I just finished installing the ECU’s and all I can say is WOW, the car really woke up, 2nd gear rolling, and nailing the throttle, it will light the wheels up, feels quicker then the Scud coup I owned, for sure and the thing just riiiippps through gears. It pulls VERY strong up top too, reminds me of the 430 GT car I drove at Daytona in the 24 Hour this year where the thing just never ran out of rev’s and speed on the top end….really impressive for sure. I am trying to find a 16m to do some rolling start races with just to compare, I am very curious to see where it stack’s up (not literally), LOL. I got my F430 Spider back from my mechanic on Friday and WOW, what a difference! The car was exhilarating when I bought the car new, and we got a 21 horse improvement with the race cats and aftermarket exhaust which I did a year ago. But the headers, carbon fiber air intake, BMC filter, and EVOMSit ECU programming have made it explosive. I’m looking forward to what you can do to my California when it shows up. Thanks! WOW…..the EVOMSit ECU up-grade with the intake and total exhaust package ROCKS. The Master Porsche Mechanic at the dealership has installed a few exhaust & ECU upgrades on Porsches and has worked on the Carrera GT, but he said that my Turbo was much better than anything he’s ever driven. With the muffler by-pass pipes on, the car really gets noticed now. Even the city cops pull up & give me a grin. I also wanted to say that the quality and craftsmanship of Fabspeed’s equipment is truly a match to the Porsche’s commitment to excellence. “I Just want to let you know how GREAT if feels to finally have the drivability on the track I have been longing for with this car! Even though Pocono’s North Course isn’t quite the ideal venue for this beast to stretch its legs, I was really impressed with the power delivery, smoothness, and drivability. The Hitachi MAF along with the V-flow intake, new throttle body, intake plenum, and EVOMSit ECU tune are just incredible! The other preventive maintenance Bodymotion performed also tied this whole package very well. Wanted to drop you both a line and once again say thanks for working out a terrific deal for me to migrate from the GIAC GT640 to your new EVOMSit GT660 package. I’ve had about a week behind the wheel and do believe I notice a smoother delivery of power – not so on/off like in the 640 package. I also feel much more comfortable with the new fuel delivery system – feeling that I’m much safer now with the new setup. As a bonus, I’m seeing about 5 mph improvement in my fuel economy. Prior to the upgrade, I was getting ~17 mpg during my daily commute to the office. I’m now seeing 22 – 24 mpg which is an added bonus. I’ve run a 1/4 tank of 100 octane through and also notices the added response as your program adjusts accordingly. All in all, I’m very pleased with the results and wanted to once again say thanks. 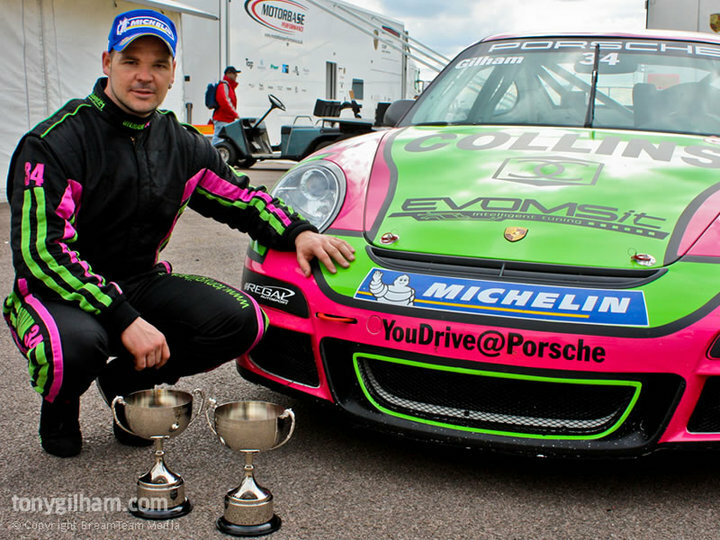 “I’ve been lucky enough to drive a wide range of stock and modified exotic cars on the race track, and the EVOMS CGT your exhaust, intake and finely tuned EVOMSit software is the best car I’ve ever driven. The new EVOMSit software has transformed the car. I never thought that just a simple software switch would make such a HUGE difference!!! This thing is a strait-up beast!! The power comes on with a Herculean force that is sure to please even the most demanding enthusiast. From the moment the throttle is mashed the car accelerates with fury….something my Softronic software was lacking. At high RPM’s the power is sheer joy….unrelenting all the way up until you bounce off the rev-limiter. I couldn’t be more happy with the stellar service I received from both RennSport-One and EVOMS. With the attention to customer detail from RennSport-One and the unmatched tuning abilities of EVOMS…..you have a match made in Porsche tuning heaven! Two thumbs up…way up! I just took the 997TT EVT700 out for a spin. It is just awesome!!! That car was absolutely tremendous to drive!!! You guys really did a great job on the programming!! Our customer is going to be thrilled. Thanks again! I just drove Xico’s car today. Very impressive, hats off to you guys . Did not drive the car at 100% but could feel the brutal power. Thanks again for taking care of this for me. I took the car out for a spin tonight, and it feels right again. I notice the smooth part throttle response in normal mode, and that flat spot I described from my previous tune is gone. Excellent Product and service! Thank you for the custom file you made us for the Maserati. The car was transformed and is a now a beast The throttle response and overall power is very smooth and very linear. Great work as usual. Our customer is more than satisfied and we have a few more customers ready to go.